You become what you repeatedly do! I believe that repetition is the key to a happy life. Joy is found in making a habit of doing good things, kind things, healthy things – and doing them often. Living our lives in positive behaviors makes us happy and encourages us to do good, for ourselves and others. Spending more of the time we have allotted on this earth in doing good, crowds out the time we have available for mischief and unhealthy behaviors. Maybe we decide to eat better but continue to eat undesirable, fattening, unhealthy foods – yet are disgusted at the outcome. Change the behavior to eating good things and self-esteem grows each time while the waist shrinks. Want to break free of addiction but won’t call out for help? What’s the likely outcome? Repetition of the positive builds strength and self-esteem to get through the difficult days. Invest in yourself and you’ll never be sorry. Please visit: Valentino Therapy at www.valentinotherapy.com for information and help on a variety of issues including: Stress, Anxiety, Addiction, Relationships, Depression, PTSD, Pain, Achievement, Habits and more. Thoughts of Suicide? Drink Coffee. Thinking of harming yourself? I say call 911 immediately. Harvard researchers, in a very recent study, found that drinking coffee may lower the risk of suicide in both men and women by 50%. I still say CALL 911 first and then make yourself a cup of coffee. Sounds unbelievable, doesn’t it? 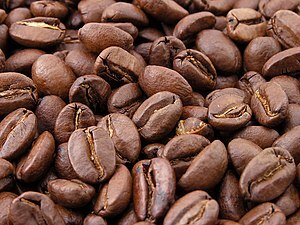 Roasted coffee beans Español: Granos de café tostado (natural). Bahasa Indonesia: Biji kopi alami yang telah disangrai. (Photo credit: Wikipedia)I particularly like this study because they used both men and women (not just men, which is all too common) and the data came from 3 large studies conducted in this country. By large, I mean 200,000 people over 16 years, which is unheard of substantiation.I particularly like this study because they used both men and women (not just men, which is all too common) and the data came from 3 large studies conducted in this country. By large, I mean 200,000 people over 16 years, which is unheard of substantiation.I particularly like this study because they used both men and women (not just men, which is all too common) and the data came from 3 large studies conducted in this country. By large, I mean 200,000 people over 16 years, which is unheard of substantiation. I particularly like this study because they used both men and women (not just men, which is all too common) and the data came from 3 large studies conducted in this country. By large, I mean 200,000 people over 16 years, which is unheard of substantiation. They found that 2 to 4 cups of caffeinated coffee per day decreased the risk of suicide by 50% and they compared them to decaf drinkers to assure themselves that it was the caffeine that make the difference. Caffeine effects our emotions via the neurotransmitters in the brain, so my thinking is this is the likely link. It appears that other drinks (tea, sodas, etc.) do not have enough caffeine to produce the same outcome. You would simply have to drink way to much for the same effect. The researchers are from the Harvard School of Public Health and just published this report in the The World Journal of Biological Psychiatry. They were quick to point out that over-consuming coffee is not healthy or helpful since you receive little benefit from drinking more than 2 to 3 cups per day. Harvard also published a study back in 2011, conducted on women only, showing 15% less depression when compared to non-caffeine coffee drinking habits. Another benefit: In 2012 several reports showed that 2 to 3 cups of coffee per day helped with Alzheimer’s, heart attacks and basil cell carcinoma. Be kind to yourself. Therapy helps.